Lowdown: The robbery of a Brooklyn bar leads to interesting revelations about the people involved. 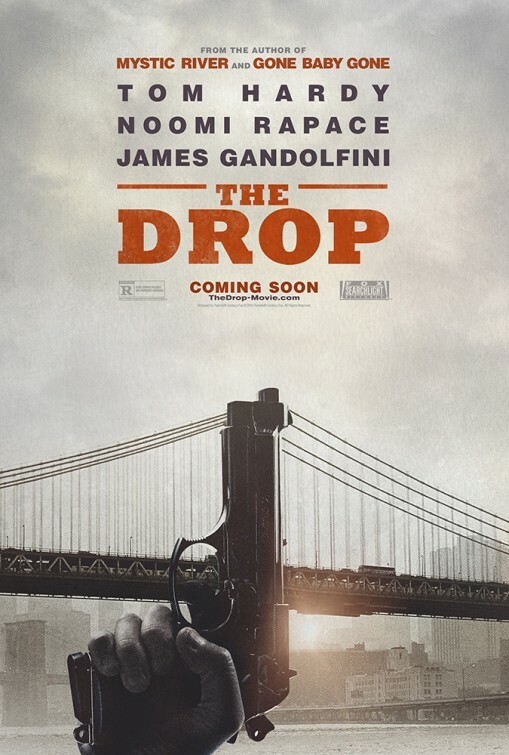 I will admit, between trailers and stuff I was completely misled with regards to what The Drop is about. I expected some mafia action movie; I was wrong. Instead, I got a slow, character driven drama involving crime. Our hero for an hour and a half is Bob Saginowski (new Mad Max Tom Hardy), a bartender at a Brooklyn bar run by his cousin Marv (James Gandolfini in his very last appearance). Bob is a bit of a Forrest Gump, if you catch my drift, but he’s a decent guy and he does his best despite hardships. For example, when he finds a beaten up & abandoned puppy at a neighbour’s garbage bin (Noomi Rapace, the original Girl with the Dragon Tattoo) he rescues it as well as get into some relationship with said neighbour. The real problems start when the bar gets robbed. You see, this bar is no ordinary bar; it is a part of a Chechen gang’s money laundering empire. The robbery, robbers and the police are not wanted here, and the onus of getting the money back falls on our two hard living bar operators. Add a known killer wanting his abandoned dog back and you get yourself the formula for The Drop. Despite the impressive line up of actors, all of which doing an excellent job (Tom Hardy – wow! ), I felt less than impressed with The Drop. For a start there was that matter of expectations; then there were things here and there that were not explained; and then there was this movie’s really slow pace. It is only in retrospect that one can appreciate The Drop, with it being one of those movie where the viewer slowly learns the meaning of what it is that they have been watching all along. Yet even then I wonder if it was worth it. If you seek an attempt at quality cinema work featuring a magnificent performance by Tom Hardy and James Gandolfini’s last appearance, go for The Drop. If you are after entertainment, wrong way – go back. I give The Drop 3 out of 5 character driven crabs.